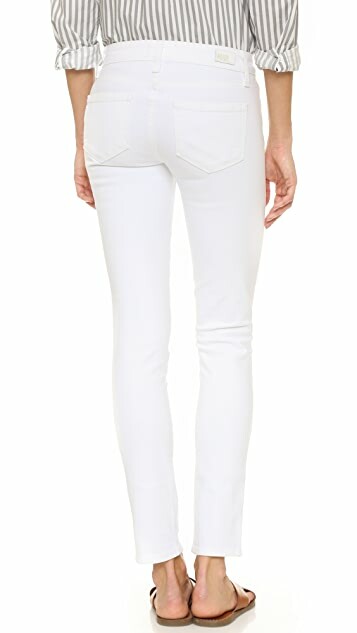 Five-pocket skinny jeans in bright white denim are a versatile complement to a casual look. Button closure and zip fly. Not at all the same as my other pair of Paige denim jeans. Very low rise and more of a cigarette leg. Nice quality denim. So sad they didn't do anything for me and had to send them back. They fit like a globe without loosing style. I am 5,5 and 120 lb + - and 25 is my Paige skinny jeans. Good purchase. 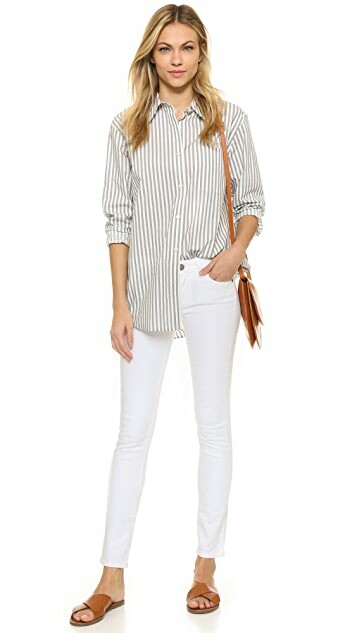 The jeans are the perfect weight for white jeans. Not at all see through. Perfect inseam length for flip flops or to show off heels and booties. I have an athletic build and so many "skinny" jeans are too tight in the thigh area, if they fit correctly in waist. These are perfect! I love Paige denim and have tons in my closet already. White jeans are very hard to find the right one. The pockets on this pant made my booty look very large due to their small shape. Great ankle jean and fit amazing. I'm looking for a jean with more shape to the back. as another review indicated, paige is no longer consistent with sizing. i usually wear a 26 but these felt like 24s. i may reorder a larger size because i love her style, but it's just a hassle to figure out my new size. I just bought a pair of Paige Skyline Ankle Skinny jeans in another color, and have been wearing this style for years, and these were incredibly tight, way too small. I feel like her sizing is all over the map lately. Go back to the traditional! I love the styles! 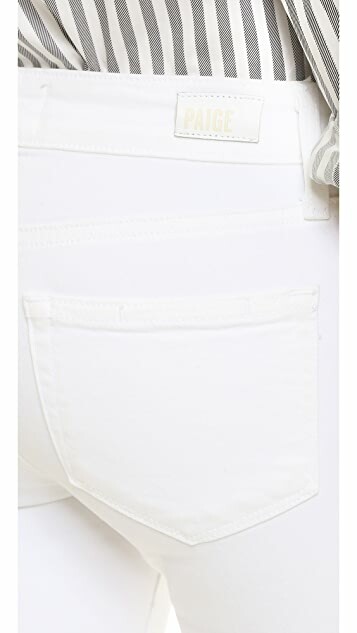 I was wanting a pair of white jeans to go with anything, any time (of year), however these are probably only Spring/Summer jeans. They are meant to be ankle-length however they crop to just above the ankle so are a bit of a funny length - so I am tending to pair these with shoes I want to feature as a result. Overall the fit's perfect and clearly the brand is well-constructed, but not trans-seasonal and not long enough for my liking. I ordered these thinking they were skinny, but they are more like straight leg denim jeans. They are also quite baggy around the knees, unflattering... I am normally a size 25, but for these I think I should have probably ordered size 23. I am 5'1 so they are quite long as well and would definitely have to get them shortened. These are going back! i sized up to a 25 in these cause i wasnt sure how they would fit. they are a little higher waisted then the sevens and current elliot jeans iam used to. that being said, im glad i sized up. they are adorable jeans! perfect length, not a see-through white. they stretch a little but will skrink back once washed. very happy with these jeans, may start buying paige denim now.